Drawing on thirty years of research and experience with organizations around the world, Drs. Dennis and Michelle Reina provide a simple and comprehensive approach that works! Their approach outlines a common language to discuss trust issues constructively, identifies specific behaviors that build and break trust, and describes steps for rebuilding trust and sustaining it over time, even during periods of change. <?xml:namespace prefix = o ns = "urn:schemas-microsoft-com:office:office"> Dennis S. Reina, Ph.D., and Michelle L. Reina, Ph.D. are organizational development researchers, practitioners, speakers, and principals of The Reina Trust Building® Institute. They specialize in working with leaders to build trust and make their organizations measurably more adaptive and capable to achieve strategic results. 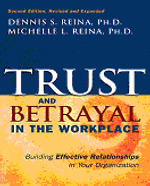 The Reinas are co-authors of Rebuilding Trust in the Workplace and the award winning, business best selling book Trust & Betrayal in the Workplace: Building Effective Relationships in Your Organization, 2nd ed. (Berrett-Koehler). They developed research-based, statistically valid and reliable instruments to measure trust systemically, practical tools and resources that help people at all levels build trust to derive desired results. For 20 years, their work has supported organizations such as: American Express, <?xml:namespace prefix = st1 ns = "urn:schemas-microsoft-com:office:smarttags"> Aetna, Ben & Jerry’s, Boeing, Children’s Healthcare and Johns Hopkins Medical Center and has been featured in Wall Street Journal, New York Times, Harvard Business Management Update, Time, CNN and CNBC. During times of change and uncertainty, trust is critical. Trust makes organizations more adaptable, energetic and capable. In a trusting environment, employees take risks, innovate more frequently, collaborate with co-workers, are more committed and responsible to drive results.